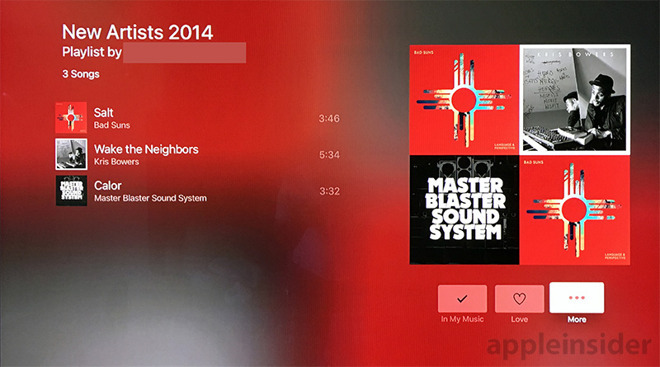 Apple recently rectified a niggling oversight in its somewhat slipshod Apple Music app for tvOS, adding a shuffle option for created playlists that saves users the hassle of executing a cumbersome workaround involving playlist sharing. As noted by AppleInsider reader Greg, the new shuffle option was activated in a quiet update sometime over the past two days and appears at the top of all user-created playlists. 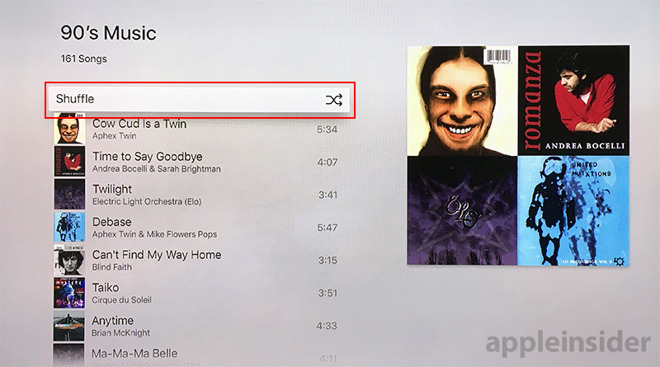 Previously, owners of the fourth-generation Apple TV were able to access, browse through and play back tunes from playlists created in Music on iOS and Mac, but shuffle was for some reason unavailable. The issue did not go unnoticed, however. Shortly after Apple's latest set-top streamer shipped out to customers in October, longtime iTunes users expecting to see the random playback feature took to Apple's Support Communities forum to discuss the problem. Forum members quickly discovered the quirk was specific to custom playlists, as they were able to shuffle track groupings in the My Music, New, and For You sections. Some user found success with a workaround that involved sharing a target playlist from iOS or Mac, either with others or themselves. Shared playlists are tagged as such across a user's iTunes account, meaning metadata is attached to a target playlist, pushed to the cloud and synced back down to other devices, including Apple TV. Unlike custom playlists, those marked as shared had the shuffle option hidden in the "More" contextual pop-up menu. Shared playlist in Music for tvOS on Apple TV. Apple's tvOS is still very much a work in progress and the company is constantly refining its first-party app bundle with compatibility and usability enhancements. Aside from minor issues like lack of playlist shuffling, Apple has promised to tackle bigger problems like bringing Siri voice control to the Music tvOS app.